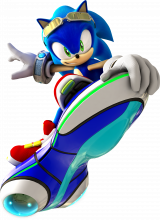 Extreme Gear are the modes of transportation used for races in the Sonic Riders series and referenced in some Archie Sonic comic books. Extreme Gear can refer to hover boards, mechanized footwear, bikes, and several other things. In the original Sonic Riders there were several Extreme Gears available. Sonic Riders: Zero Gravity adds the ability to upgrade gears mid-level for ability enhancement. When collecting the upgrades the appearance of the gear changes and parts are added. There are three types of gear in the game: Boards which are available by default and are the only gear used in story mode. Skates usually have slightly lower performance than boards, but burn less air. Bikes, which resemble floating mopeds, have higher performance but burn more air. Most gear must be purchased from the shop or unlocked in story mode. There are 54 Extreme gear vehicles in total. Blue Star: Sonic's default gear. The game information state that the board was built by Robotnik Corp., but a story mode cutscene shows Tails building it. Blue Star II: Similar to Blue Star but has better speed and poor cornering. The game information state that the board was built by Robotnik Corp., but a story mode cutscene shows Tails building it. Yellow Tail: Tails' default gear. Red Rock: Knuckles' default gear. Type J: Jet's default gear. Type W: Wave's default gear. Type S: Storm's default gear. Pink Rose: Amy's default gear. E-GearG: E -10000G's default gear. E-GearR: E -10000R's default gear. Channel 5: Ulala's default gear. Night Sky: NiGHTS' default gear. High Booster: Has better Air Boosts but than normal but consumes more air. The pattern on the board is similar to the Shadow the Hedgehog symbol. Auto Slider: Auto air-slides when turning. Speed Balancer: Performs well on straight roads, but has poor turning and endurance abilities. Access: Allows its user to fly. Fly types can't use this board since they can already fly. Accelerator: Increases the speed of boosts. Trap Gear: Tornadoes use up no air and using it makes you faster rather than slowing you down. Boosts cannot be used. Light Board: The lightest board available. Tricks can be performed easier and boosts won't be slowed down unless the player is attacked. Slide Booster: Air Slides don't burn air and the player can boost from an Air Slides. Boosts cannot be used, however. The Crazy: This uses rings instead of air to race. The use of rings, maybe a reference to paying a fare as this gear is similar to the taxi featured in Crazy Taxi. Opa Opa: Level 3 attacks will always be used. This board is a reference to the classic Sega game Fantasy Zone. Powerful Gear: Has the highest endurance. Rough roads do not slow the player down. Turbo Star: High acceleration but low top speed. The name "Turbo Star" is also the name of a vehicle found in Kirby Air Ride, which is a game Sonic Riders is often compared to. Fastest: Has the highest top speed but bad cornering. Don't tricks won't replenish the air gauge. Legend: Jumps will reach maximum height but the air gauge won't be replenished by performing tricks. Gambler: When in first place the player will be awarded double rings. Abilities cannot be used whatsoever. Berserker: Automatically attack opponents. Air can only be gained after level ups or by attacking an opponent. Magic Carpet: Similar to the Access gear as it allows characters to fly. Air Broom: Allows all characters to grind. Hovercraft: This is the worst gear in the game. Even though the attributes are high the controls become over-sensitive, thus racing becomes more difficult. The cloud belongs to The Legend of the Monkey King. Chaos Emerald: A board that only Sonic can use. When equipped he will turn into Super Sonic and gain all abilities. Rings will be consumed instead of the air gauge. Grinder: Simiilar to the Air broom as it allows all characters to grind. Advantage-F: Fly characters have better acceleration. Advantage-S: Speed characters get a higher top speed and better acceleration. Advantage-P: Power characters get higher endurance and better power abilities. Cannonball: Consecutive boosts which don't burn air can be performed. Attacks are not possible and the air guage can't be replenished by performing tricks and abilities. Air Tank: Poor attributes but better air. Omnipotence: This grants your character all abilities but the air gauge won't be replenished by using them. Cover-S: Speed characters have higher acceleration and better endurance. Cover-F: Fly characters have higher acceleration and better endurance. Cover-P: Power characters have higher acceleration and better endurance. Heavy Gear: The heaviest of all gears. Speed and endurance are good and there's no slowdown when charging for a jump. It can't ride turbulences. A picture of the USA flag can be found on the back. The design is similar to that of a Harley Davidson motorcycle. Hang On: The main theme for the Sega arcade game "Hang-On" will be played. Super Hang On: The main theme(?) for the Sega arcade game "Super Hang-On" will be played. This page was last edited on 21 May 2013, at 01:45.